Charity Sale for the Foundation at the North Loop Strip Block Party! Mega Sidewalk Sale- Tons of Cool Cheap Stuff plus Hicks Foundation T's, Hicks CD's and DVD's Music and more! 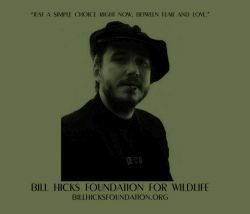 Drop by and see the new foundation T featuring a rare photo of Bill by David Johndrow. New "choice between fear and love" shirt available!